The actor: Throughout his career, Judd Hirsch has had the ability to deliver dramatic performances just as successfully as comedic ones, with the most prominent example occurring when—in the midst of his Emmy-winning turn as Alex Reiger on Taxi—he earned an Academy Award nomination for Best Supporting Actor in Ordinary People. Although Hirsch continues to pop up in big-screen roles with some regularity, he’s most consistently on the small screen, where he can currently be found playing Ioan Gruffudd’s pal on the new ABC drama, Forever. 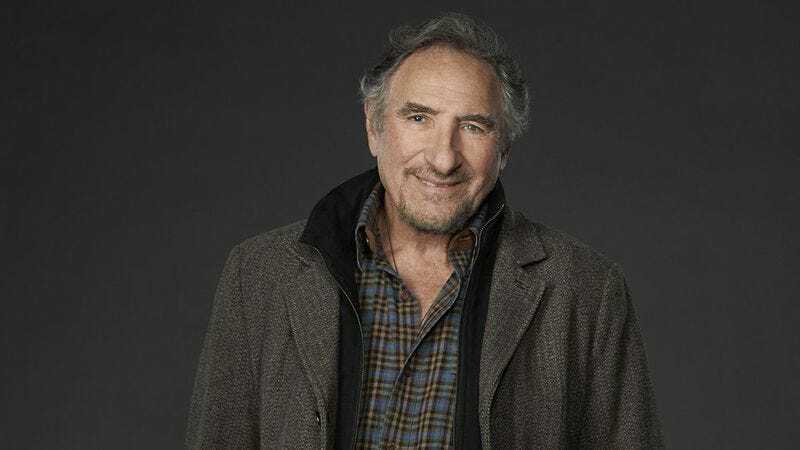 Judd Hirsch: I’ve changed the name of some of the characters I’ve worked on—two of them—and I would’ve changed this one, too, but I didn’t have the chance. [Laughs.] They found me for this—it’s surprising, but I was the first one asked to do it, out of anybody. I kept on wondering why. You’ll have to ask them why, because I’m still not sure. I’m not the actual lead of the show. The only thing I’ve heard is, “They just wanted to find out if you’d do it.” And when I read it, there was no question. The A.V. Club: By the end of the first episode, viewers will discover a very interesting tidbit about Abe’s past, but if you don’t mind dancing around that spoiler, exactly who is this guy? JH: Aside from me? [Laughs.] If given the opportunity to do this in real life, if I had a really great friend who was like Henry, then I’d be this guy. I’m Henry’s best friend—I’m his only friend—and there’s such a history to it that the series is going to have to be a long one to tell our story, because his story goes back quite a while, and mine does, too. I’m not playing a youngster! The wonderful thing about it is that [Ioan and I] will find out as much as everybody else who’s watching how much history is in my character, who is completely attached to his character. I remember I had a best friend a long time ago, when I was 16 or 17. We were both kids from the Bronx, and this best friend of mine, the only thing we ever did was walk and talk about what the world was and what we were in it. When you’re a teenager, you want to find out the rights, the wrongs, the morals, this thing called love—And we had these discussions, my friend and I, for a long, long time. I started to think about this when I got the series, because Ioan is very much like him. They’re both my height or taller, they’re both quite handsome—and that was part of the whole thing, because I was always envious of my friend’s looks. [Laughs.] I started to think, “What if that guy that I knew—what if I found out he was immortal?” My life would’ve been so much different than it is now. For one thing, I probably wouldn’t have been an actor! I mean, I could show you a picture of the guy: He really does look like Ioan! It’s interesting to start a project not knowing all the things about yourself. Normally for me, the preparation would’ve been, “Okay, so I was in the service, and—what else?” Well, I don’t have to know what else, because as it comes up, the only assurance they have is that Judd Hirsch is the character. Not that they’ve used my history—but they can if they’d like to! [Laughs.] Because a) I come from New York, b) I’m as old as the character, and c) like I said, I’d be like this guy if my best friend was like him. AVC: In trying to find your first on-camera role, IMDB suggests that it’s an uncredited appearance in a film called Jump. Was it? JH: Oh, God. Yeah, uh, the original name of that film wasn’t even Jump, but—I think we filmed it in Florida. I was just some jerk walking around New York, and I went down there, and we were on this sort of assembly line for some kind of food—like, peaches or apples or tomatoes. I know it’s a film about racing cars. That’s all I know. I’ve never seen it. And I don’t know the name of the character, if you’re going to ask. JH: Oh, it says “actor”? That’s a good name. It’s “A,” so you come up early if you’re listed alphabetically. [Laughs.] I remember them saying, “You should really learn the accent.” I said, “What accent?” They said, “Tampa.” I said, “What Tampa accent? They have more of an accent in North Carolina than they do down here! Coming down, as soon as you hit below Virginia, you all of a sudden hear the most Southern accents you’ve ever heard in your life, but you get to Florida—and they don’t have one!” “Yeah, they do!” [Adopts a presumably intentionally awful Southern accent.] So we were tryin’ to talk like this and all that kind of thing, and… [Sighs.] It’s probably the worst—well, I don’t know what it looks like, to tell you the truth. I’m surprised that you even know what it is. AVC: Well, as I said, you can blame it on IMDB. JH: Well, you always have to be ashamed of what they have on IMDB. [Laughs.] I mean, that’s part of the business: the shameful ones and the proud ones! I was a kid that loved to kid around. I liked to make people feel either uncomfortable or comfortable. So I went to acting school. I thought, “Maybe I can find an avenue there.” Then I got so fascinated by it that I never even thought about the reason why I’d gone that route to begin with. But looking back at it now, you can call it “by virtue of depression.” [Laughs.] But I really didn’t start very early, because I didn’t have a family who was in the theater. When I started, I was 25 years old. AVC: Your first series role—well, first it was a TV movie, but then it became a series—was in The Law. JH: Yeah! That’s what’s called the “launchpad.” [Laughs.] No kidding! AVC: How did that come about? Was it just a standard audition situation? And then they shipped me out to Los Angeles, where I had to interview and do casting, and I thought, “Well, if they thought I was right back there, what do I have to do out here?” “Well, this is Film Land. You don’t have film on you. They’ve got to see you. They’ve got to stick you in front of a camera and see if you’re still alive when they take the picture, you know? You could be the devil, and you won’t come out on film. They don’t know!” [Laughs.] Anyway, I don’t know why, but I passed. I had to do a monologue, it was about three or four pages, and they had a crew just to shoot me. They were all tired, they’d already just done a day’s work, but they came in and stuck me in front of this camera and said, “Go!” And I went. I said, “Oh, God, they’re going to be looking at me like they’re the most bored guys in the world. They’re going to be, like, ‘Ah, we gotta do this for some guy? Who’s this guy?’ They don’t know me!” But by the time it was over, the entire crew applauded. After that, I went, “I think I got this job!” I still don’t really have any idea how I got it in the first place, though. All I know is that he went to the hospital in the middle of shooting, and we all thought, “We’ve lost our director, and we’re stuck in Yugoslavia!” But they shipped a guy in who was, like, a director doctor. [Laughs.] He fixes up things when the other director can’t do it. And I had a death scene—I got shot!—which I had all figured out. I thought, “I don’t want to do that dumb thing where you simply fall down.” This was a vicious man we were on the hunt for, a man who’d killed many, and he was called The Whip. But he shoots me, and I worked it out so that—because there was a door behind me—I was going to fall backward through the door. I thought, “This is going to be great.” Because it was so creepy, you know? There’s a little drumbeat before it all happens. We all sneak down a hallway, we’re going to find him, and I happen to come upon him. You can hear the beat—thump, thump, thump, thump, thump, thump—and then I open the door, and the guy shoots me. So this should be quite a shocking thing. But the director says, “Nah, just fall down.” I wanted to kill him. [Laughs.] I just wanted to kill him. “My first opportunity to be killed like this in a movie, and you’re going to take the opportunity from me?” But I think I wasn’t strong enough to make the battle. I just said, “Ah, I’ll just do it.” That’s when I started to wonder about television movies. AVC: When you mentioned having to audition with a monologue for Universal, I immediately thought of your big speech in the pilot for Studio 60. They shot it from every angle you could possibly imagine. I know this guy, Tommy Schlamme, who was the director. He shot it from the front, underneath my chin, from each side, and a camera that went over my head and came down! It was the most extraordinary thing anyone’s ever given me to do, and I was very proud when the day was over, because I was sweating! And then, of course, they come and I get fired. But I thought, “Ah, this is going to be a great series even without me. And maybe I’ll have a chance to come back! Who knows?” But, of course, they changed the whole thing, and it didn’t go the way it was originally going to go. I don’t know why. I have no idea. But that’s what usually happens. You’ve got to watch out when you do a series. They start with an idea, and somewhere along the line it gets—I don’t know if it’s because certain opinions are added, but all of a sudden it gets sidelined for some reason or other. I did another series like that, and that lasted only one season. Sometimes they take the wrong angle, and the thing that was good about it in the pilot—they don’t stick to it. If something runs long enough, they sometimes don’t stick to it because they can’t. All of a sudden, they have to serve other people. Not the first year, though. You usually try to spend the first year coming out like the pilot. AVC: That other series you mentioned where something shifted: Was that George & Leo? JH: I had more fun doing the pilot, because Jimmy Burrows directed the pilot. He wasn’t going to direct the series, but we’d worked together on Taxi, and he was, like, the most well-known director. We always laughed together, and we’d always come up with something, because we’d suggest stuff to each other. And that’s what we did on the pilot, which was done twice because of some recasting. I just loved the character. He was this pain-in-the-neck guy. I was going to be the biggest pain in the neck to Bob Newhart. [Laughs.] I just loved that idea. That was a great twosome, you know? But then the series went awry. They started to write silliness. I don’t think it’s what Bob wanted it to be, but it was like they were trying to make it into The Bob Newhart Show, and that’s not what it was supposed to be. It was supposed to be about our relationship and about our kids, who were going to be married. I was a guy who wasn’t going to go home, so he was going to have to put up with me forever. [Laughs.] Now, that’s a wonderful thing to do for a television series. But it didn’t happen, and, you know, you learn your lesson. Hey, not all of them work. JH: Oh, yeah, when they brought back all of his people? AVC: And some of your people, too. AVC: More recently, you played Marc Maron’s dad. JH: [Starts to laugh.] It’s funny, because I thought at the beginning of my career that I’d be doing a show or a play like that. That would even be the genre. I thought I’d be that kind of a character. Not the dad, because I was too young, but that kind of a… [Glances toward the recorder.] May I use the word “schmuck”? AVC: So how was Maron to work with? JH: Oh, he’s dreamy. He loves all the people that work there. It’s his show, and he has his own problems about the show, but that’s about what he wanted to have come out. He writes it as well, most of it. Well, a lot of it, anyway. It’s a very special kind of a show. I didn’t think anybody ever watched it, though. I was like, “A podcast? What’s that? I don’t even know what it is!” But then I come back home, and people will stop me in the street. A lady says, “Are you Larry Maron?” And I thought, “Where do you see it? I don’t even know where to see it on TV! Where can you find it?” She said, “I’ll let you know.” [Laughs.] Where is this show, anyway? Is it IFC? JH: Okay, I thought so. I don’t even know the channel number! [Laughs.] But let me tell you something: It is a very popular show. When you look at the groups that see it, they number in the thousands and maybe in the millions. I don’t know, because I’m just going on people telling me. I had no idea. All I did was do my part, you know? JH: Well, that’s pretty much the first movie I did, I think. AVC: The first where you actually played a character with a name, anyway. JH: Oh, we had a cast of such different people. Eric Roberts was my son, and Sterling Hayden was the king. Sterling Hayden was on pot the entire shoot. He lived that way. He lived on a boat on the Seine, and he came over from Paris, on his boat. That’s how he lived and died. His career was over in the movies, I believe, and here he was, an older man. It was so weird, because I loved this guy, and when I was a kid, his movies were terrific for me. Even in The Godfather—when he was older. He was such a big guy. He was, to me, one of the more interesting guys in the movies that I saw when I was a kid. And here he was, this older guy, still a lot of power in his voice, but… [Starts to laugh.] He was just smoking all the time in his trailer—and then he’d come out and try to remember something! AVC: When I interviewed Eric Roberts a few years ago, he mentioned when he first visited Sterling Hayden in his trailer. JH: Yeah, I know. He couldn’t live when he wasn’t on it. I felt sorry for him, because he was probably sick. Eric was interesting, because I think that was one of his first movies, if not his first, and he was a kid who had a stutter. That stutter! But as soon as the camera went on, the stutter was gone. You’ll never see him stutter in the movie. But you will see him shoot me! That was the first time I ever had to do my own stunt: going out the second floor of a building. I’ve got blood bags on me, and I had to go backwards out of the window—really falling out of a two-story Manhattan apartment—into an airbag on the street. A guy showed me how to do it, and he said, “Can you do that?” And I said, “Yeah, I can do it!” Okay, so I do it, and I come back, and they say, “Can we do that again? Because something went wrong.” You know how they throw a switch and the blood bags go? Well, I had a shotgun in front of me, and when I came back, I came back with dots on my face, and they thought it was because of the shotgun. So I said, “Yeah, sure, okay, I can do it again.” And I come back with more dots on my face, and I said, “You see this?” “Yeah.” “It’s not the shotgun.” They found out it was the explosive device with the blood bags. “Can you do it again?” [Laughs.] I was in a play at the time, so I was filming during the day and doing the play at night, so I said, “Well, okay, but I’m not doing it anymore!” Meanwhile, people on the street are going, “Hey, look at that guy who keeps falling out of the window. That’s Judd Hirsch! He’s doing a play down the street!” Yeah, that movie was a very strange experience. So I came to meet the director, and I kept thinking, “Oh, crap. I’m not going to be old enough. I’m going to be Jeff Goldblum’s father”—and Jeff was 44 years old—“I’ve just got to convince these people that I am my age.” I was, but they’d never believe it, see? So I wore the oldest clothes I could find, and I came in with this haggard look, but I was very—active. I said, “If the part is anything like what I read, the guy is not acting his age. He’s feisty. That’s who people are now. You’ve got a lot of feisty fathers walking around now, because we betray our age.” So he’s sitting there, and then he goes [In a German accent.] “What can we do with his hair?” [Laughs.] So when we started, they were walking around make-up, going, “We’ll curl it, and we’ll gray it!” So that was a whole thing I had to go through. They kept on trying to make me look older than I was, even though I was probably the age that they needed. Originally, though, the character’s name was Moishe. And as we’re walking up the stairs, I said, “Can I, uh, not play Moishe?” “What do you mean?” “I just can’t play Moishe. It’s so obvious. And I can’t play a guy like that. I just don’t know who this Moishe might be in me.” So Dean Devlin said, “Okay, what would you like?” This is my first day! And I thought of Julius Caesar, so I said, “Julius!” And he said, “Great! That’s my grandfather’s name!” [Laughs.] So I changed that [name]. JH: [Looks slightly aghast, then laughs.] I always get stuck in these parts where there’s a problem. There’s always a problem in the making of the movie, whether it’s somebody in it or something else, and Nick Nolte was—I love this guy. I just thought he was so great. He’s telling me—[Adopts a fantastic Nick Nolte impression.] “I’m not really an actor, y’know. I failed at football, and I failed at this, too!” I’m thinking, “You’re talking to me as a failure!” He had a problem. And so the producer comes over to me and says, “What the hell can you do for us?” I said, “For whom?” He said, “What can you do about Nick?” I said, “Uh, I don’t know.” He was trying to get me to get Nick to do something, so that, when he couldn’t remember something, I could sort of help him out. So I said, “Just shoot up from this point. Then you won’t see him shaking. You won’t see his hands, you won’t see his feet, you won’t see anything else.” And, of course, he was wonderful after that. He was who he was. He was just a faulty guy. I had a good time, but—it was in Columbus, Ohio! It was a zero! For me, Columbus, Ohio was like putting me in a doll house. And it was the middle of winter! Plus, it was a lot of kids. But we had a lot of really silly people. What was the guy’s name? He’s no longer with us, but he played another teacher. Richard Mulligan! [Wistfully.] Oh, he was my favorite. He had such an idea about acting, which was wacky and wonderful. Nobody’s like him. And he played this teacher who comes in, and he’s not really a teacher. He’s a crazy person. And he’s the best teacher in the place! [Laughs.] He’s teaching history, and he’s dressing up as the famous people of history. AVC: Whenever I think of that film, the first vision that comes to mind is Richard Mulligan dressed as George Washington. JH: [Laughs.] I just remember the idea was so funny. And Mulligan was a great guy. He was a really great guy. JH: Well, that was obviously a tremendous opportunity, because I think that when they wanted to do it, it was the year before that, and they didn’t. I don’t think they could get everybody together. Also, [Robert] Redford—it was his first directing job, and he wanted to change the script, but he couldn’t get the author back in time to fix the script to do the movie. Alvin Sargent was the author. So when he finally got everything together and was able to work with Sargent again, that’s when they got me—and I was on Taxi! So I was on loan. [Laughs.] But from the same studio: Paramount. AVC: What was your reaction when you found out you’d been nominated for an Oscar? JH: I was shocked, first of all. And so was Tim Hutton. And we were in the same category! Tim was not nominated as the lead, he was nominated as Supporting Actor. And I kept thinking, “Wait a minute, if there’s anybody that’s the lead in this one, it’s him! My God, the picture’s about him!” Well, they probably knew that he wouldn’t win as the lead actor. It was going to be Robert DeNiro [for Raging Bull], no matter what. So they probably put him into that category, knowing that they had Mary Tyler Moore and Donald Sutherland, who they could consider the leads. So Tim got into that category, and then someone told me that I was nominated, and I said, “Oh, this is ridiculous! What’s worse than losing that one? Winning!” [Laughs.] Because it would rob Tim! He became a really good friend of mine, because we spent all the time doing that movie—the time that I was in it—together, both on-camera and off-camera. All we did was play games. And his father [Jim Hutton] had just died, so I had a very sensitive young man with me. But it was great. JH: Rhoda was kind of fun, although I remember not wanting to do television. It was, what, ’77? Yeah, that was not meant to be. [Laughs.] They had changed the Rhoda show—the husband died or left or they got rid of him, and they changed her to give her a job—and I became the romantic interest and did two shows. I was a guy who used to watch Rhoda on television before that happened, because it’d been on a while, and the guys who actually wrote Taxi were some of the show’s writers. Of course, I didn’t know that yet, because Taxi wouldn’t come up ’til the following year, and I was about to do a play on Broadway. I loved Valerie Harper. I thought she was really wonderful. She really was the show. So the opportunity to do it, and the fact that she liked me, was great. I mean, what if they’d said, “We got Judd,” and she’d said, “Well, that’s not exactly what I was looking for”? [Laughs.] But we kind of liked each other an awful lot, and it really was a pleasure working on that. She’s kind of a stage actress, you know what I’m saying? She was always a really good stage actress. We could go for the same values that we would if we were doing the script as a play. That’s what I liked about her. So it was a nice opportunity, but then I thought, “Okay, that’s it, I’m not going to do any more of this stuff.” And along comes Taxi. JH: My agent said, “They really want you to do this.” I said, “No, no, no, no. No more, no more. I want to do movies and plays, and I’m going to go to Europe, and I’m taking off!” He said, “Well, what do I tell them?” I said, “Well, I mean, send me the script. I haven’t even seen anything.” So they send me the script for Taxi, and I said, “Aw, crap. This is going to be at least a three-year show. I’ll be an old man by the time this goes off the air. Ah, Jesus. But—still, probably not.” My agent says, “So what do I tell them?” I said, “Make them an offer they can’t accept!” He said, “What if they accept it?” [Laughs.] “Just do that!” He did. They accepted. And I had to take it. AVC: You actually ended up with your name above the title. I thought, “Jesus! They are not going to like me! I’m going to be the person that makes them say, ‘Who the hell is he? Who does he think he is? Coming from New York! What did he do? Nothing!’” [Laughs.] “He did Rhoda!” So I was going, “Oh, man, am I embarrassed…” I didn’t ask for that. They did it for their own purposes, thinking that maybe I’d bring in something. Nobody knew me! I mean, not really. Not on television. But they thought otherwise. And I lived with it for five years. AVC: As far as the ensemble goes, how quickly did you guys gel? But the cast was great. We had parties every Friday night. Champagne and everything. We shot on Friday night, and every single Friday night for the entire duration of that show, we had a party afterward—at the studio, no less. You stayed until the last person went home. You’d see the guard go home, at two o’clock in the morning. And the ABC lineup was just great back then. We had the most winning night in television: Happy Days, Laverne & Shirley, Three’s Company, and Taxi. We’d walk into each other’s studios on the Paramount lot. That’s how great it was. Everybody visited everybody. In fact, they were on our show! Bosom Buddies was part of the ABC lineup at the time, and Tom Hanks did an episode of our show. Both him and the guy who was with him on the show [Peter Scolari]. It was a great time to do this kind of television situation comedy, because Paramount’s lot was full. It wasn’t just ABC. It was Paramount. They owned comedy. They owned the best shows. I hardly did anything that wasn’t at Paramount. Taxi was done at Paramount. Dear John was at Paramount. George & Leo was done at Paramount. Even Numb3rs was Paramount! We just didn’t shoot it there. AVC: Before we go, I have to ask: how did you find your way into Sharknado 2?